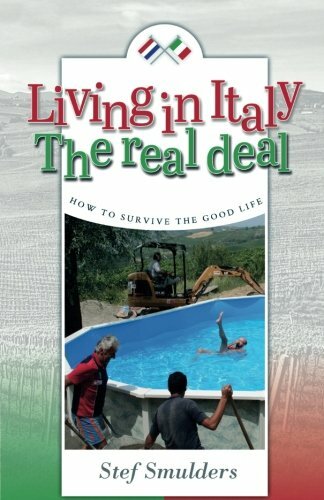 Article first published as Book Review: ‘Living in Italy: The Real Deal – How to Survive the Good Life’ by Stef Smulders on Blogcritics. “Living in Italy: The Real Deal – How to Survive the Good Life” by Stef Smulders is the sensational story about a couple’s emigration to Italy to start a new life. Readers witness first-hand the vicissitudes of moving to a new country and adjusting to the local bureaucratic officials, systems, and customs. When Stef Smulders and his husband Nico set out for Italy, it was not without a plan. Stef was going to continue studies for his Master of Arts in Medieval Culture while Nico enjoyed a six-month sabbatical. Very early into their stay however, wooed by the countryside of Northern Italy and driven by a secret wish, they found themselves looking at properties with the intention to stay permanently! And so the journey begins. Smulders storytelling artistry is wildly entertaining. His lively telling of events such as buying and renovating a house (that is to become their dream bed & breakfast), establishing residency, making new friends, and various other adventures, provide distinct pictures of learning by doing, and how to truly “survive” the ordeals one might find on the road to the good life. Crisp, concise chapters take the form of short stories and weave together seamlessly to create a whimsical, light-hearted, and refreshing memoire of the author’s complete Italian experience. The chapter titles, all formatted in Italian, set the tone for each story, often consisting of common phrases or topics of concern, such as non ci sono problemi (no problem), di fiducia (trustworthy), or é piccolo il mondo (it’s a small world), among others. The author’s casual style of mixing the Italian and English languages into the narrative made me feel right at home as the daughter of Italian immigrants, which translated into an immediate connection and a sense of being at home. The characters are delightful and I laughed aloud throughout the reading at some of the obvious stereotypical characteristics of Italians, like the obsession with their health, their fashion sense, and the overall chaos that surrounds the average person (not that anyone would ever admit to anything of the sort). At the end of the writing, the author entices readers with an invitation to visit him and Nico at their bed & breakfast, the Villa I Due Padroni. Be sure to check out the gorgeous villa on the website referenced in the book. A quick glance of my own left me longing to take them up on that proposal. Overall, I found “Living in Italy: The Real Deal – How to Survive the Good Life” by Stef Smulders to be a greatly entertaining story. Fans of short stories, humor, travel, and different cultures will all find something endearing to take away from this impressive five-star read.